Gum Disease Treatment – how is it done? At Atlantic Dental we are carrying out Gum Disease Treatment painlessly under local anaesthesia. Before you attend your appointment you already had a Hygienist appointment and have received Oral Hygiene Instructions such as the use of interdental brushes (Easypicks) and other tools. This is an absolute precondition for a successful treatment of your Gum Disease! In some cases, we will dispense/prescribe Antibiotics which need to be taken at the time of the treatment. The combination of oral Antibiotics and the removal of the Biofilm has proven to be very effective in treating chronic periodontitis. Deep Scaling and Root Planing to remove the destructive Biofilm. Sometimes the gum is swollen due to the gum inflammation after the gum disease treatment the gum can shrink slightly as the swelling subsides. This can lead to increased sensitivity (especially to cold). At Atlantic Dental we also use a Device called “HELBO”. The Treatment is also called “antimicrobial photo-dynamic therapy” This combined treatment approach reduces the number of destructive bacteria (i.e. Staphylococcus aureus) significantly. The patient will be treated under local anaesthesia. The pockets, bleeding and tooth mobility are measured and recorded in the patient’s file. The pockets are then thoroughly mechanically cleaned using scalers and curettes. The photosensitizer (dye) is applied and after the contact time rinsed out. The pocket probe (Helbo Laser) is inserted into the pocket and activated. The procedure can be repeated in severe cases with 7 days to achieve the best results. Since introduction in our practice, the HELBO Photodynamic Therapy has shown great results in the treatment of Periodontal Disease and Peri-implantitis. Staphylococcus aureus is a bacteria which is responsible for infections around dental implants (Peri-implantitis). It is also present in cases of MRSA because of its affinity to titanium surfaces and resistance to many Antibiotics. Dental Implants manufactured from titanium are at a high risk of infections if the neighbour teeth are infected with Staphylococcus aureus. Within minutes of the placement, a dental implant is colonized with Staphylococcus aureus bacteria from the surrounding teeth! 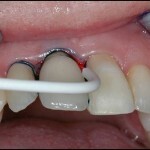 Therefore the treatment of gum disease before dental implant therapy is essential. The treatment of Staphylococcus infected implants is difficult as local antibiotics don’t reach the areas. The use of systemic antibiotics is very questionable due to the fact of the ever-increasing global resistance to antibiotics. Mechanical cleaning of implant surfaces is difficult as the risk of damage to the implant surface is high. It also does not remove the bacteria completely. The concept of photodynamic therapy has been proven to be very successful in the treatment of peri-implantitis. We are offering this treatment to our patients as well as to patients who had implants fitted elsewhere. I agree to Atlantic Dental using my personal data to provide me with information about dental treatment options. I agree to Atlantic Dental using my personal data to keep me informed about marketing offers and initiatives that may be of interest.